Following on from the success of the University of Lincoln’s Applicant Open Day postcard, we were asked to design and print a leaflet summarizing the University’s assets. The University requested an enticing piece of collateral to hand out at their Open Days and Higher Education fairs. We developed the same minimal, contemporary design of the postcards, with a silver block finish. We were also asked to design and produce 15 pull up banners and apply a silver, mirrored effect vinyl to the banners to compliment the design of the postcard and leaflet. 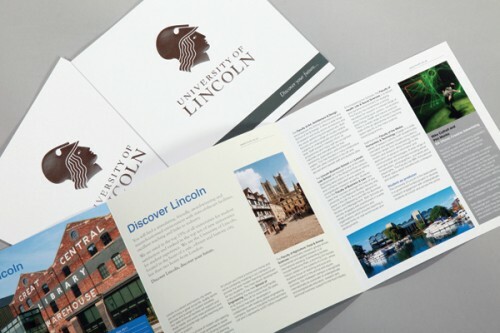 As we have worked with the University of Lincoln for many years we have a good understanding of their corporate identity and the style and tone to be captured within their literature. The strong working relationship we have with the University means we are able to turn projects, like this one, around quickly and efficiently – exceeding the client’s brief and coming in on budget (if not under! ).